An interesting article came over my horizon recently regarding family trees and ancestors. It was written in Lithuanian by Algirdas Urbanavičius, who has evidently delved into this field. He writes that not very long ago, people were more in tune with their origins than we are today. According to the author, people were familiar with their ancestry up to seven generations back, because it was important to know what you might inherit. Citizens of yesteryear realized that nothing is random, relatives are not just a bloodline, but various characteristics passed down from generation to generation. Thus before marrying, they would want to discover as much as possible about the family they were joining, so they could foresee the family‘s destiny and what their children were likely to bring into the world. Apparently, old Sanskrit teachings, the Vedas, tell us that we are the first generation; our parents are the second generation. They influence us most strongly through their personal example. They provide the model of family relationships; a daughter will model after her mother, a son after his father. Even subconsciously they mimic their parents‘ behaviour. Parents also influence their children‘s world view. Children inherit habits, lifestyle, manner of speaking, emotional expression and physical attributes. According to this theory, the most dominant characteristics are passed down, thus each generation is ever more intelligent, skilled and able to improve. Children do not necessarily inherit their parents‘ actual talents, but the parents can create a beneficial environment for them to flourish. The third generation is two grandfathers and two grandmothers. This theory postulates that we inherit creativity, intellect, initiative, interpersonal skills and outlook from them; most often grandfathers pass these on to granddaughters, grandmothers to grandsons. Illnesses may also be inherited from grandparents, but parents are also responsible for providing a healthy environment and good habits. These teachings also parse the types of qualities that are passed down from paternal and maternal grandparents, for example the paternal grandfather passes down creativity and energy; paternal grandmother – worldview and material values; the maternal grandfather – interaction and relationship skills. 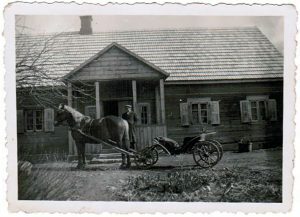 Arguably the star of the foursome is the maternal grandmother – she is the keeper of motherhood and family relationships, passes on intuition, emotions and feelings, our connection to home, homeland and homestead (namai, tėvynė and tėviškė). This is the scary part: it is very important for grandparents to be virtuous, to pass on virtuous values to their grandchildren. If the grandparents are “complicated“ people having negative traits, it is likely that their grandchildren will take on that negativity. The fourth generation – great-grandparents – are eight ancestors. From them we inherit feelings of harmony with the world, appreciation of beauty, morality and the ability to love. The fifth generation is the keystone of the family. From it proceed the highest virtues or the darkest sins. The generations become more nebulous the further we go back: the sixth generations consists of 32 ancestors – from them we get genetic harmony or disharmony, balance or imbalance, lightness or darkness of spirit. The Vedas say that symbolically these ancestors are like our 32 teeth – the upper jaw representing the father‘s family, the lower – the mother‘s ancestors, reflecting their strength, purity, or early decay. 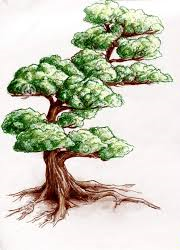 The seventh generation consists of 64 ancestors. Misfortune and violence in this generation can influence the destiny of its descendants, despite their best efforts to avoid them. What can we do with this information besides relegating it to the realm of mythology or astrology? Urbanavicius says that although we have no influence whatsoever on the behaviour of our ancestors, it is simply important to know this and not blame ourselves, for example, for our children being good or bad, for difficulties in creating harmonious relationships or achieving spiritual growth. Sounds like a wonderful excuse. However there is merit to tracking genetic health tendencies, because as we know, there are some diseases that can be avoided or at least mitigated by practicing or rejecting certain habits. 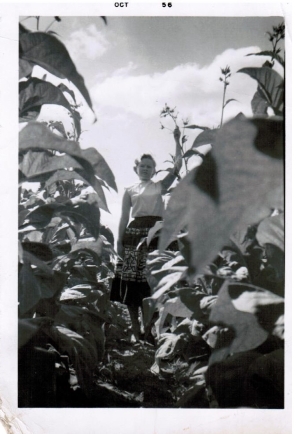 It would be fascinating to find out about our earlier ancestors, but as children of immigrants, many of us do not have at hand the means to gather the threads of our connections without on-site research. The lesson: interrogate your elders while you can! Thank you to Peg for sharing her experience and giving us concrete information about directions we can take to start a family tree or story. Inspiring ideas and concrete decisions to be made. Sharing like this is an excellent way to motivate and to teach others! It’s true that the DNA aspect of genealogy can be limited in some ways. As children of immigrants, we may know the names of and have even met our relatives, as I have, and so I was not completely surprised that my DNA test showed me as 99% Lithuanian. And although the services provided through sites such as Ancestry can reveal relatives we did not previously know, there is also the possibility of being queried by people who have no connection to our relatives. I was recently questioned by someone who thinks we are related, but none of the names, places or dates match at all. What does knowing my ethnicity give me? Proof – possibly, but there are currently all kinds of doubts being cast upon the testing and its accuracy. (By the way, no one in our generation – dragged to Saturday school and folk-dancing, forbidden from dating “others” and scolded for not speaking Lithuanian – truly had much doubt as to our ethnic background.) Possibly more useful is the analysis showing predisposition to certain diseases, but there again, it may be solid evidence only in some cases, and how useful is it in reality? How can you prepare? Fodder for dinner conversations – do we want to know, or not, and how much? I think Peg is right that collecting material for the family story is most important: this is what we would like to preserve for the next generation, to find and mark our place in history, in a sense. Every family has a story. And displaced families especially need some sort of anchor in a mixed society here in North America. So, back to the box. It does now have files named according to family branches. As soon as I declutter the sewing paraphernalia that’s currently on my office futon, I will bring it out and aim for chronology. And inspired by Peg, I will begin to compile my family history. I must remember – it does not have to be a Pulitzer Prize contender. My notes and my thoughts in my own handwriting will be more revealing as to who I am. You never know what you’ll find in your Box! This was my baby tag. Logic dictates that I begin my story with my parents’ arrival in Canada, as it is easier than trying to go backward from there, for now. A future visit to Lithuania and the tiny cemetery that my grandparents are buried in by the old homestead, while it is still standing, is in my plan for Part Two. Nice to meet you! I am Peg, the web developer for www.lithuanianheritage.ca. Like you I have a passion for genealogy, starting about three years ago. I am not Lithuanian but, just like you, my family immigrated to Canada. I want to know where my family came from and why. My interest started with two old silver teaspoons: one marked “London”, one marked “St. Nazaire”. They were a gift from my great aunt when I was a teenager. All I knew was that she, despite being a small-town Canadian girl of English origin, had trained as a nurse in Scranton Pennsylvania and then served with the American Red Cross in World War I. I had to find out where she’d gone, what she’d done and why she did it. That was the start for me. I think that genealogy study comes in three flavours. Each one needs a separate approach but all three have the same underpinnings. The first is the analysis of DNA. Of course, you have seen the ads on television for DNA testing from sources such as ancestry.ca and 123andme. Finding out that your ethnic background is either singular or very diverse can be both fun and helpful. You may be able to limit your search to a specific part of the world or it may open up leads you hadn’t thought of. In Scotland people have been using DNA with a great deal of precision in a tribal sense. Haplogroups are a big area of study but I am afraid that I use mine more for cocktail chatter than anything. 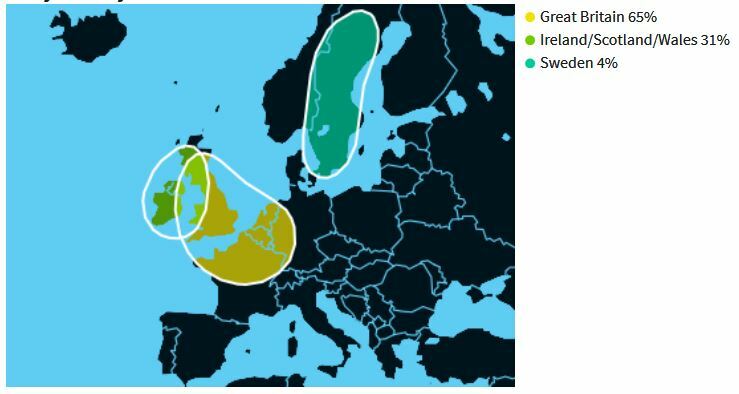 My DNA map: where did the Swedish come from? The second type of study would be what is called a “Name Search”, the type where you create a family tree. This type requires the most detective work of all. It can be incredibly frustrating as you chase for months for a single fact that has eluded you and then exhilarating when you find it. This type of research often provides the surprises and the unexpected. My family name “Douglas” is about as Scottish as it comes. Imagine my surprise to find that this part of my family is actually from southern Ireland and came to Canada, like many Irish, in the Great Famine period. This single fact changes how I think of my family by quite a bit. In my family tree I have two Samuel Marlborough Douglases (father and son) who between them had 6 wives, four of whom were named “Mary”! The only way I can keep it all straight is to document it carefully. 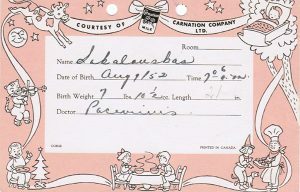 The Ontario Genealogical Society provides very helpful forms on which you can record your data: https://wellington.ogs.on.ca/ The forms are found under the “Getting Started” tab on their main page. I use the Vital Statistics form (for details of birth, marriage and death) for each individual, the Family Group record to group family members together, and the Pedigree chart to create a family tree. The forms become invaluable when time elapses between finding facts and to help work out conflicts in information. They particularly encourage you to document the source of your data: essential if you ever need to reverifywhat you found. I also group all my information by person in a tree structure of folders on my computer. My father Ted’s folder contains his information plus two subfolders for his mother and father. Ted’s father Fred’s folder contains his information plus subfolders for Fred’s two parents. In each folder I’ve put images (jpgs or pdfs) of vital documents such as birth, marriage, death registrations, census lists etc. That way I can go back and reverify anything I need to. As I search for records I try to remember that most of the data was recorded by hand and that the recorder didn’t necessarily have good handwriting. I always need to search for: Douglas, Dauglas, Daglas, Dugles, Dhuglas (Gaelic), Dogles, Douglass, Duglas… you get the idea. At the Archives we’ve been told that finding information on Lithuanian families can be difficult but you may find items if you search for the Polish or Russian version of your name, remembering that dark time when the Lithuanian language and culture were suppressed. 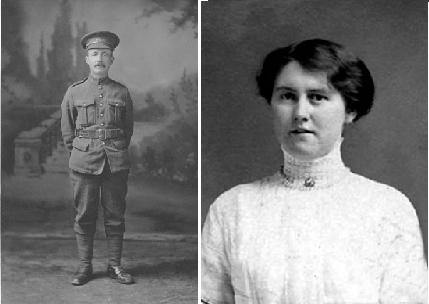 You may have guessed by now that my favourite type of genealogy is to tell the story of a person in my family. Why did this person come to Canada? How did their family influence the direction of their life? Where did they go and what did they do when they got there? In addition to learning about my ancestor, this type of genealogy allows me to do a deeper dive into the social history of a specific time period. Besides photos and letters, these stories usually need some name research to help place the person in their family context and to fill out details of their life. So those forms I mentioned in Name research are really useful as you create a story. Is writing a story like this difficult? Starting can be rough but once you are immersed in another person’s life it becomes much easier. My stories have been given as gifts to my parents and had far more impact than I could have imagined. They were amazed at what I was able to find. I answered a lot of questions that had been around the family for years but had never been answered. And it called forth bits of knowledge to help me move forward on other family members. I would never describe myself as a good writer but these books are treasured and are pulled out regularly. The big trick is just to get started somehow, anyhow. I the case of my aunt I started with an email to the American Red Cross. After all, it was the only fact I had. A wonderful volunteer answered me almost immediately with suggestions on where to go looking and how to do it and I was off and running. There was a bit of back tracking because of errors in some of the record keeping. Eventually, and with a couple of referrals back to the volunteer, I was able to become certain that I had the right story. Wide, contextual searches help too. 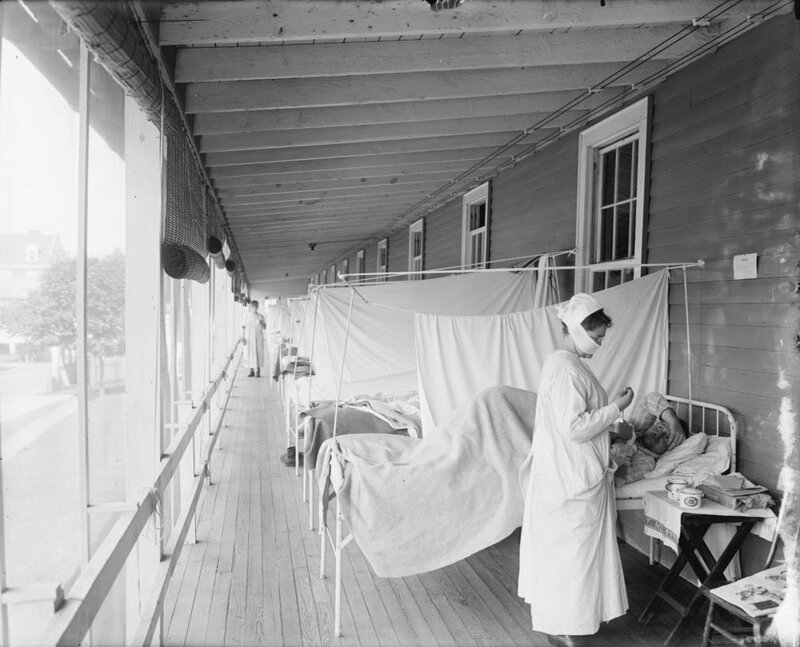 I did a lot of research on nursing in World War I in order to understand what it was like for the nurses going off to war. I got really lucky: one of the books for general research had a wealth of photos from the specific hospital at which she served. Among those photos was a picture of the whole nursing staff and there she was! I also want to commend to you www.familysearch.org. This website is a huge resource and collates most of the free genealogical data sources on the web. Although it has been sponsored by the Church of the Latter Day Saints, its orientation is non-denominational and I haven’t found a reason not to use them. They also have local family history centers which you may visit in person. These are staffed by volunteers who are mostly not members of the LDS and can help you get started. As with all genealogical data, the origin of the data needs to be evaluated before using it. Another is www.wikitree.org which has the ambitious task of creating one giant family tree for the whole world! You can give back by volunteering to work on genealogical projects yourself for an Archive or one of the databases like familysearch. For example, familysearch uses volunteers to read and transcribe records from new sources which are then added to the database. I am hoping that this post will help you find the type of genealogy you really want to do, then get started. Every time I go backwards in time I find out something new. I would love to hear what you’ve found out for yourself. Now back to finding out exactly when George Douglas came to Canada. Bring out the pipe, the hat with earflaps, and be a Sherlock! At some point, the photos and documents your have in your family records and memorabilia box may not be enough. You know where your parents lived, that is – wherever you grew up. Chicago, Montreal, Toronto, Boston… You have pictures of some relatives, sufficient information for a good start on a Family Tree. The wheels have begun turning in your head and you realize that you want to know the whole family story from as far back as possible. No one else in the family is as excited as you are, because a) they’re too young, or b) they’re lazy, or c) they don’t know how to go about it. Apparently, you can hire someone to do this, but it’s much more fun to do it yourself, because it’s interesting and educational detective work (also known as research). All you need is your computer (and mouse, if you still use one)! For example, you may have met or heard of cousins, as I have, with whom you can compare family trees, but the connection is not crystal-clear. From our latest conversations, I now know that the cousins in question found relatives in a town called Rokiškis. Contacting them would be the simplest way to discover how our fathers are related. You may also write to the local museum (find it on the city‘s website) to ask for a link to any available archives. Official archive services (archyvai.lt) may require an application form and a fee. Cemetery records are available via the internet, however the date of death is usually required, as I found out from my query to a cemetery in Kaunas. If time is limited, your first line of questioning should be directed at any and all existing relatives. Write to them, call them, ask for photos, dates of birth, marriage, death. BEFORE IT‘S TOO LATE!